Gas patio heaters, propane, butane garden heaters for patios, decking, Pubs, clubs and hotels>> buy online.. 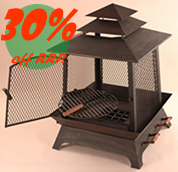 Massive savings off our range of Firpits & Braziers. The ultimate in luxury patio heaters as used in pubs, clubs and bars etc worldwide. Perfect for extending Spring / Summer evenings in the garden, at BBQ’s and garden parties. Fully adjustable heat output. "Superior quality four piece heat reflectors" and Italian piezo ignition. Free cover for winter protection, Free wheel set to easily move it around your patio, Free ground anchor set to securely fix it to the ground for added security, Free automatic tilt cut off switch, Free gas hose and Free gas regulator. Just add a propane / Butane gas bottle from your local store. This means this unit has been tested in accordance with stringent European regulations to ensure it is safe to operate. Safety is paramount especially if you have children or pets. This patio heater features the latest Japanese made anti tilt Automatic Shut Off Mechanism. This ensures that as soon as the heater tilts to 20°, it will completely shut down all gas flow. In addition to this, if the heater is returned to an upright position the gas flow remains off until manual re-ignition. These have the superior full size 4 part, 82cms aluminium reflectors. All our units are manufactured to an excellent high standards. We have these heaters on our own patio and it really makes a difference! Luxury Gas Patio Stainless steel.